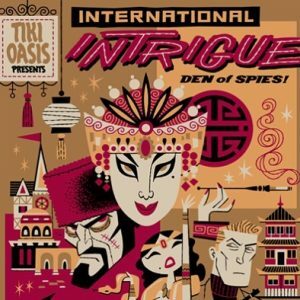 As is his usual modus operandi Ken from the cocktail syndicate is back with the officially Unofficial Tiki Oasis 2017: International Intrigue mix. It's really chapping my hide to have to listen to this since for the first time in a few years I'm not attending Tiki Oasis. I had to buy a roof and some siding for the house --neither of which I ever get to really look at you know seeing as they're on the outside and I'm on the inside-- which really put a dent in the old pocketbook. And following on the heels of my trip to New York, where the Suave's spent money like drunken sailors on leave, and ahead of an upcoming mele kalikimaka holiday expedition to the Hawaiian islands, money is tight. Like .... well never mind what it's tight like. Get a cocktail and loosen up for a good time. WELCOME TO TIKI OASIS TV!